AGEAN GREEN FOOSBALL TABLE – A CARROM® Foosball Table is designed to stand the test of time for durability and play value in your family home with unsurpassed CARROM® quality. 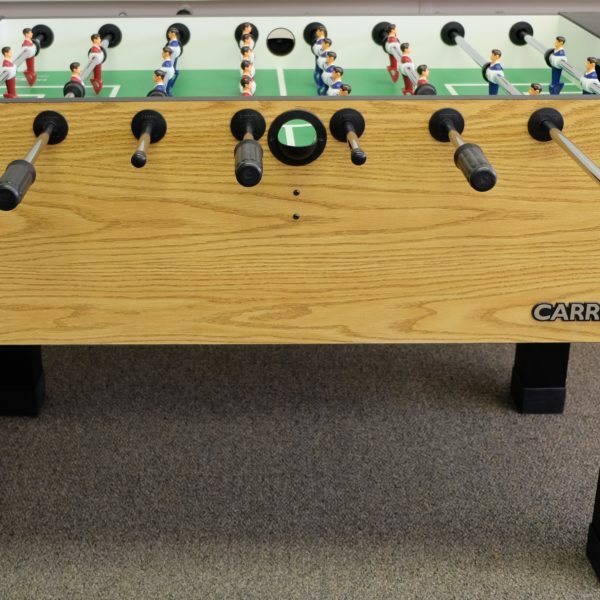 A CARROM® Foosball Table is designed to stand the test of time for durability and play value in your family home with unsurpassed CARROM® quality. The reinforced play surface ensures a flat field for consistent ball roll without the warping effect of games made with lesser grade materials. Superior quality triple chrome-plated steel rods paired with stay-true rod bearings increase response speed and provide self-lubrication with long lasting durability. CARROM® quality design and furniture grade components set this premium foosball table apart as a handsome and inviting addition to any living environment.